UPDATE: 2nd Free Promotion Underway! 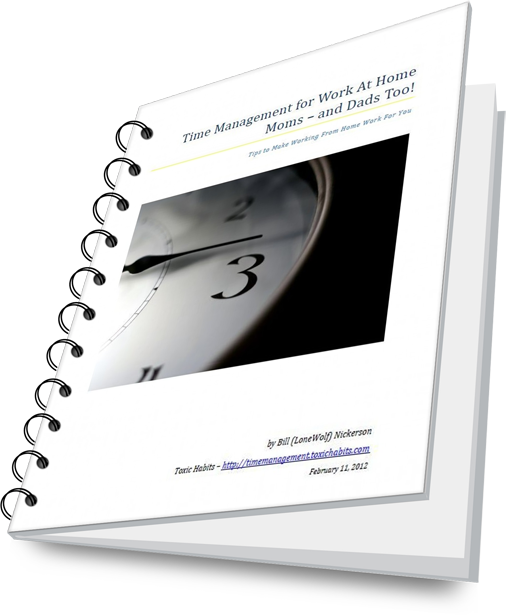 Time Management for Work at Home Moms – and Dads Too! (Kindle edition) is available for free. But this is a limited time offer! The free promotion starts on Tuesday, August 21st and lasts for 48 72 hours. The start time is approximately 3 a.m. EDT (or midnight on the Western coast where Amazon lives). So, by the time most of you are reading this the promotion will actually be under way. When you take me up on this offer, I’d appreciate it if you could give me some feedback on the book. Shoot me an email with your thoughts — perhaps something I could add as a testimonial on the sales page. Leave a review at Amazon, Goodreads or anywhere else that book reviews or posts about time management or work at home parents are welcome. Please be honest in your reviews. I would also appreciate any social network sharing that you can do to help promote the book. Even if you aren’t interested in it I’m sure that you know people who might be. Now is a great chance to give them a heads up on a free product! Doesn’t it feel good to hook your friends up with a great deal? Just use the sharing buttons here to share this post! Thank you, just what I need right now! You’ll get some good tips from the book. Make sure to check back here for more help with managing your time. Can I still get your book for free?